This route includes a car transport. This route includes a ferry. This route may have road closures. The “E” in “I-90 E” was the first indication that something was wrong. Then I digested the distance and time… and scrolled down a few pages. Now any route planning that takes you literally more than halfway \ around the world had better take in some amazing sights along the way. Luckily, this was the case. The route straight across southern Russia looks interesting. Also the curving route through China to Hong Kong. Now we’re talking! 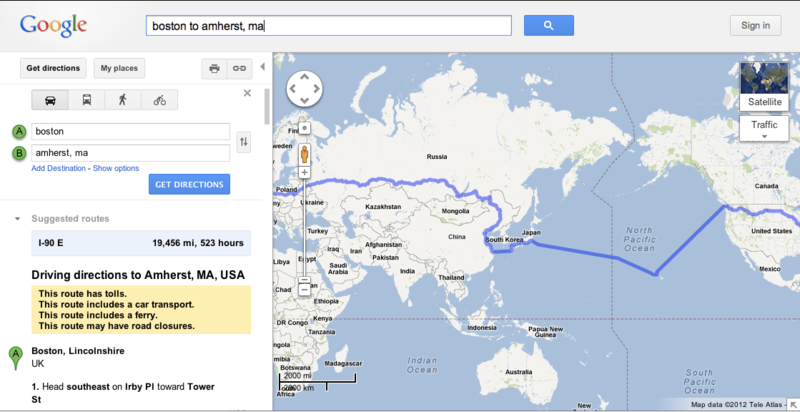 Apparently you can jet ski straight from HK to Japan… maybe your car can use the teleporter. Don’t miss the slight left just past the big landmass. Note it took 60 directions just to cut across Japan before getting back into the ocean… welcome to Hawai’i! From here the rest was pretty straightforward: Sail across the Pacific once more, then drive across the US, picking up I-90 (remember that?) soon after making the mainland. 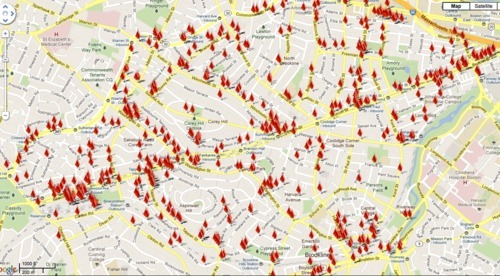 All in all, an enlightening trip and look into the heart of the route-finder. Which clearly has good taste in beaches. ↬ Grinding ↬ Ales Kot & discussion of the recent NYPD drone controversies. Love and death and hope. Here’s wishing him a fruitful and productive year. Higgs boson confirmed! World’s media mass At CERN in celebration. CERN has posted and archived beautiful 360-degree photos of the day, a video of the press conference (rather dull), and will soon post a recording of the day’s seminar (which was live-streamed and amazing; come back for it tomorrow). The media as usual tries valiantly to explain things in a down-to-earth way that is both simplistic and true, but is generally failing. As with a few other recent scientific breakthroughs, I am grateful that Wikipedia offers solid explanations of the topics at hand, and through the magic of hyperlinks (which news agencies are still struggling with 🙂 allows exploration of the topics in as much depth as you like. Related reading: supersymmetry, scalar field theory, htlhcdtwy. Note the careful, conservative trend in particle physics: the labs making the discovery are all quick to say they’ve discovered the existence of at least one new particle, which matches the profile of the Higgs boson; it could be one or more of its sibling bosons that have been discovered – supersymmetry suggests there could be 5 of them. My recent post about China’s parody of the annual US reports on national human rights made me want to read the actual reports. It’s the sort of cleanly organized information that I love, combined with the lack of citations and categories that I hate. We’ve never issued a high-level summary of that form about our own country. But we did take part in a review of national human rights last year, for the UN Human Rights Committee – something similarly high-level but less methodical. Those 200+ recommendations just keep giving. Algeria made the recommendation I did above, “include and rank the human rights situation in the US in the annual country reports on human rights – as was done for the annual report on trafficking of persons” (in 2010) This was met with one of our few specious responses: no need, also we don’t rank anyone. Norway is awesome. They make 7 solid apolitical recommendations. No rehashing international policy disputes or convention-signing, which can be nominal at best: a focus on essential changes that can be carried out now, and would be historically significant. All this gets at my initial questions in more detail than I knew how to ask. Details after the jump. This document is difficult to read. It is a Chinese government doc trying with awkward sincerity to review human rights in the US by our own standards, most of which the authors clearly find arbitrary. It’s like a baby wikipedia article: full of random tidbits that happen to have been published somewhere online. With a mix of real issues and rumors, minimal context, axe-grinding, and undue weight to whatever attracted media attention. It lacks the measure and professionalism of the US report it is responding to (though it gets partial credit for making a handwave at its sources, which our reports should do much more of). But it does point out one oversight in our list of country reports: we do not publish an internal report on developments within the US in the same format — though the relevant data is gathered by other parts of government. This made me wonder: what sorts of reports do we put out? Could we remedy that? I was also reminded that plans to set up an umbrella national human rights institution have come and gone… were any still under active consideration? So I checked: the closest thing we have to such a report is the quadrennial self-assessment of human rights that we compile (as every UN member should) as part of the UNHRC’s “universal periodic review” process. What I found was enlightening and surprising, though not always encouraging. It is worth its own review; stay tuned for a future recap. Car Racing Ex-Con meets Orphaned Insomniac: They Fight Crime! He’s a war-weary devious gentleman spy who knows the secret of the alien invasion. She’s a vivacious mute advertising executive with an incredible destiny. They Fight Crime! A simple little puzzle, that will charm you blind. Graffiti is being wiped out across the city of Brookline by a wave of hyperrealist art. If you’ve ever wanted ‘tattoo removal’ for that Banksy your overpass got when it was young and carefree, or want to know which bricks match Textured Rusted Umber, this Tumblr’s for you..
It’s like The Man Who Planted Trees for a smooth, unblemished urban landscape. A nutshell guide to the language by the floating-point divide. Have your own feelings? Share them! 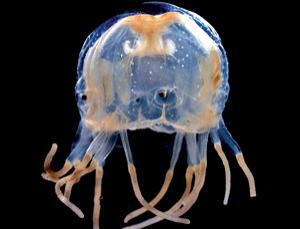 Cubozoa, or Box Jellyfish, are remarkable creatures. Among jellyfish – the oldest multi-organ creatures on the planet – they are some of the most highly developed in terms of nervous response, memory, and sensory organs. Some cubozoa species are among the most venomous creatures per weight on the planet, using a very effective poison for hunting. They have a ‘neural ring’ which help coordinate their nervous system, the closest thing to a brain that jellyfish have been observed to have. They have some capacity for memory and to learn from experience. They live largely in mangrove lagoons, where as many as 25 different species of Cubozoa may occupy different ecological niches, and forage at different times of day. And they have 24 eyes, 4 of which are ‘true eyes’ with corneas and retinas – two of which can see color! They have been observed to navigate by visual cues out of the water, such as trees on shore. The 20 lesser eyes sense light more simply, and some point straight up at all times, thanks to a keen adaptation: they grow small gypsum crystals within their bodies at the base of their ‘eye-stems’, which act as a plumb bob to keep the eye pointing skyward. In general I am no great fan of jellyfish – and can’t quite believe I am writing about them – but in this case the eyes (and angels) have it. Cubozoa are amazing.